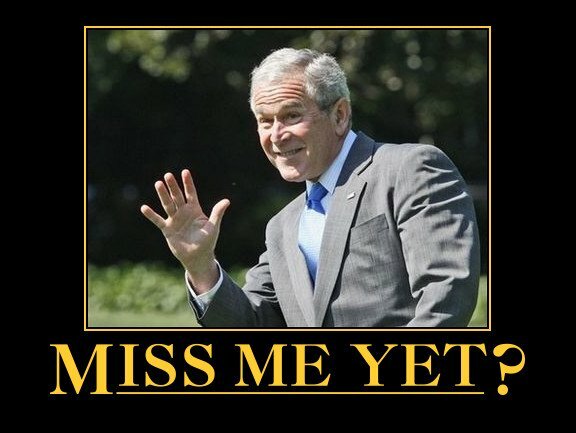 BUSH SCREWED UP THE ECONOMY? • Continuing Wilson's income tax that penalizes success. • Continuing FDR's Social Security that turns equity into annuity. • Continuing LBJ's welfare programs that maintain a poverty cycle. • Stimulus packages and bailouts that reward corporate failure. • Reducing job creation by continuing federal corporate taxes. • Pandering to unions that restrict the US labor market. • Diluting our work force with "reverse-discrimination" programs. • Allowing the AMA and trial lawyers to keep medical costs high. • Maintaining a costly military presence in the middle east. • More government intereference through "anti-terrorism" laws. • Deficit spending that undermines the strength of our dollar. • Allowing US oil production to decrease so we have to import more. • Increasing the size and scope of the US federal government. • More regulation of energy, education, and health care. • Playing golf and going on junkets while the economy foundered. 19:47:35 Mountain Standard Time (MST). 2910 visits to this web page.